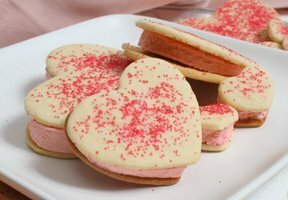 Our Valentine Ice Cream Cookies are cool treats for warm hearts on Valentine's Day. They are easy and fun to make. Make them ahead of time and then have fun handing them out to all your special Valentines. Valentine's Day is for both young and old. Check out our suggestions on how to enjoy this Valentine's day with all your Valentines. See step-by-step instructions on how you can make this rich and creamy dessert to serve to your special Valentine.